MachPanel has built in Migration Utility to facilitate customers leaving other panels and opting for feature rich MachPanel Control Panel. 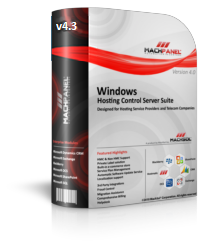 The MachPanel Migration Tool assists in importing Exchange Subscriptions and Organizations for Resellers and End Customers from “MSPControl”, “WebSitePanel” and “Hosting Controller” to MachPanel. Why MachPanel is the panel of choice over its competitors? MachPanel is globally trusted cloud automation solution that comes with fanatical support to back your business round-the-clock! We just don’t sell the product but we build strong business relationship that speaks for itself. MachPanel v.5New! is rolled out with more flexibility, scalability, and functionality enhancements, including 3rd party integrations and support of latest Microsoft Enterprise products. So, if you are looking for Cloud Automation at its best? Look no further! MachSol brings you MachPanel v.5 – The Most Comprehensive Cloud Automation Solution Ever that revolves around the latest Microsoft technologies e.g. Microsoft Exchange, SharePoint, Lync, CRM, Hyper-V and BlackBerry and Web Hosting. MachPanel v.5 can reshape your entire cloud business from service acquisition to service delivery and management, clientele development to commission based resellers, technical support to billing and reporting – everything made possible via intuitive self-service web based control panels. MachPanel v.5 introduces a lot more opportunities to increase your revenue and takes you far ahead of the competition. It supports, Microsoft Hyper-V 2012 R2 that no one else does. Alongside, you can take full advantage of Lync Enterprise Voice Reporting offering more ways to increase your profits. MachPanel v.5 supports White Label and ready to go Commission Based Reseller Model that will truly expands your overall revenue opportunities. Contact Us Today for More Details Or Purchase Now! 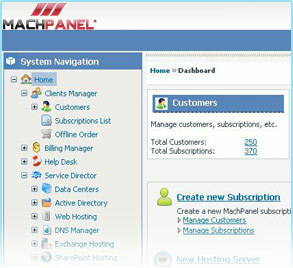 Lync 2010 is fully supported by MachPanel. Verified and added support for “SmarterStats 7” in HostMatic Module. Added Chinese language pack to translate MachPanel into Chinese. Export Customer List – First Name, Last Name, Company and Email Address fields. Disable Auto Processing from Service Queue. For more information about MachPanel, visit our website at: http://www.machsol.com or call Toll free number: +1 877 622 4765. Our Sales & Support team is always available to assist you in every respect. What is MachPanel Provisioning System? MachPanel Provisioning System is a unified control panel system for the delivery and management of both traditional web hosting and profitable SaaS hosting services. It includes management control panels for provider and self-service control panel for their customers. Hosting Service Providers (HSPs) and Telcos use the economical, quick and unified MachPanel Provisioning System platform for the delivery of traditional hosted services such as web & data hosting and new profitable hosted services (SaaS) such as hosted Microsoft Exchange 2007, Windows SharePoint Services (WSS), Microsoft Dynamics CRM, BlackBerry Enterprise Server etc. MachPanel Provisioning System MachPanel v.4 offers much more functionality to cater almost all needs of hosting business for service providers, resellers and end users. Unified integration of shared web & data hosting alongside SaaS hosting clearly implies the great significance of MachPanel’s new major release (i.e. version 4). MachPanel now allows extensive flexibility by providing automated billing, help desk, network monitoring, management & provisioning services. Besides operational add-ons, this new version is equipped with a cool new look and user interface that makes the job easier and simple.